From left: Parking Association of Georgia President Don Walter; Mobility and Parking Services Analyst Dominic Ross and President Veleeta McDonald; and Savannah City Manager Stephanie Cutter receive the Organization of the Year award from the Parking Association of Georgia. 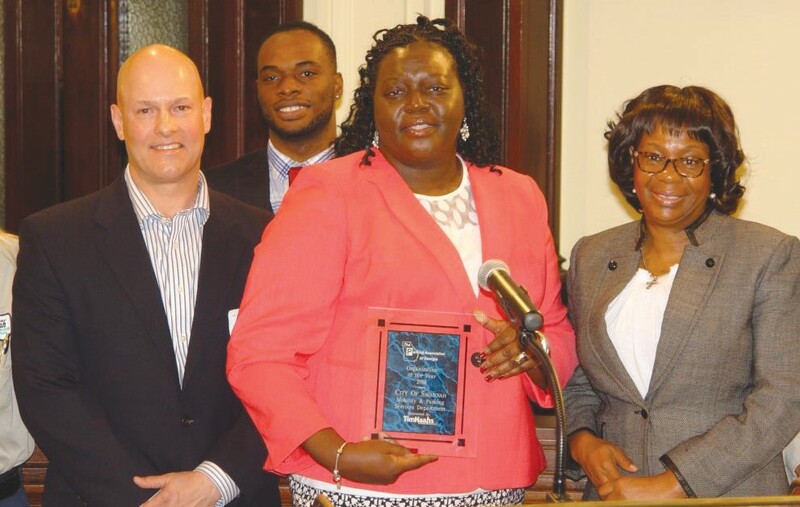 The Parking Association of Georgia on Thursday awarded the City of Savannah Mobility and Parking Services Department with its highest honor – Organization of the Year. The honor is awarded to the operation – public or private – that contributes the most to the State of Georgia in the area of parking over the past year. The City of Savannah has added more than 3,000 garage spaces to downtown Savannah over the past two decades, implemented new technology to enhance customer service, and encouraged alternative forms of transportation by adding electric car charging stations and bike lanes, and partnering with Chatham Area Transit to create the first bike-share program in the State of Georgia. For the City’s efforts, the American League of Bicyclists awarded Savannah a Bicycle Friendly City Designation.